Amazon Closing 87 Pop-Up Kiosks As Its Retail Strategy Shifts The giant online retailer is closing all of its U.S. pop-up kiosks, which let customers try and buy gadgets such as smart speakers and tablets. It's the latest change in Amazon's retail strategy. Amazon is closing all 87 of its pop-up kiosks in the United States, such as one seen here in Denver. 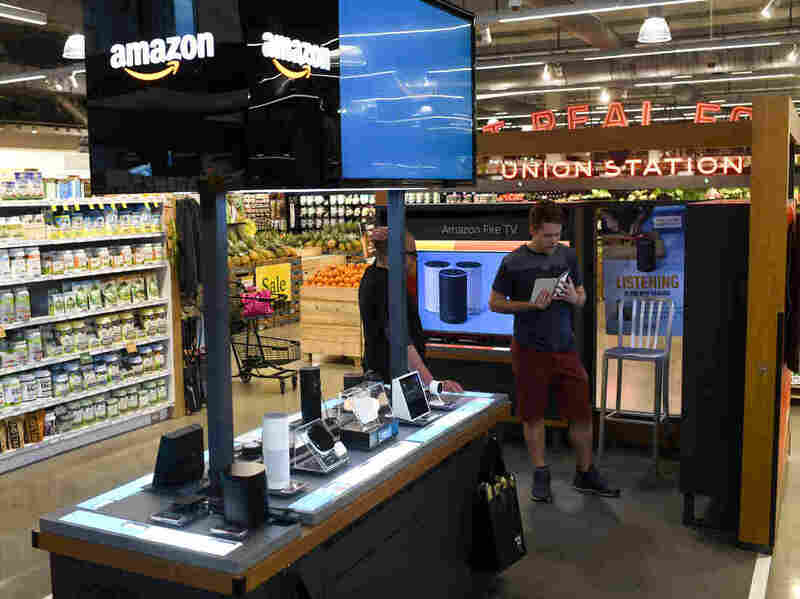 Amazon, the giant online retailer, is closing all 87 of its U.S. pop-up kiosks, which let customers try and buy gadgets such as smart speakers and tablets in malls, Kohl's department stores and Whole Foods groceries. It's the latest change in Amazon's bricks-and-mortar retail strategy, which includes bookstores, grocery stores and cashier-less stores. "Across our Amazon network, we regularly evaluate our businesses to ensure we're making thoughtful decisions around how we can best serve our customers," an Amazon spokesperson said Thursday. Instead, the company is expanding Amazon Books and Amazon 4-star retail stores, the spokesperson said. Amazon 4-star stores, currently in New York City, Denver and Berkeley, Calif., sell various products, including consumer electronics, kitchen products and books that are rated 4 stars or above by customers on Amazon.com. The pop-up kiosks are expected to close by the end of April, The Wall Street Journal reported. The news comes days after a Wall Street Journal report that Amazon plans to open dozens of grocery stores in several major U.S. cities. Those stores would be separate from the Whole Foods Market chain, which Amazon bought in 2017 in a $13.7 billion deal. The Amazon spokesperson declined to comment on the report. Last year in Seattle, the company opened its first Amazon Go store to the public. The automated stores replace cashiers with a smartphone app and hundreds of small cameras that track purchases. A customer's Amazon account is charged as they exit the store. There are currently 10 Amazon Go stores in Seattle, Chicago and San Francisco, according to the company's website. Amazon said it launched Amazon pop-up stores in six European countries during the 2018 holiday season. It was unclear if those stores would be affected by the closings. Editor's Note: Amazon is one of NPR's financial supporters.